This week we have the Atlanta Falcons coming to Tampa for the final game of this season. When I think of the Falcons I always think of chicken. This weekend is also the beginning of the New Year. With this in mind I thought about a little hangover inspired chicken. So this week I introduce my Bloody Mary Wings. These are tasty and will sure cure a New Years Eve hangover. In a small bowl, mix together the rub ingredients. Sprinkle the dry rub over the chicken wings, coating them evenly. Prepare the grill for cooking over direct medium heat. Grill the wings, turning often, for 30 minutes, or until the wings are crispy and golden. Meanwhile, mix the sauce ingredients together and set aside. 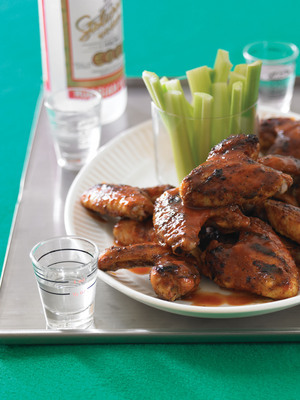 Transfer the wings to an aluminum-foil pan and pour the sauce over the wings, tossing to coat. Put the pan with the wings back on the grill. Cover the grill and cook for another 30 minutes, tossing the wings after 15 minutes to coat. If the pan goes dry, add a small amount of beer to keep it from burning. Remove the wings to a plate, and drizzle with the sauce if there is any left. *This recipe yields 4 servings. Make sure you increase all amounts equally when tailgating with more friends. Is the defensive improvement real? Just like the Bucs in NOLA, we plan on showing up tonight!